Ahead of IFA, there were rumours that Sony was to release a third SmartWatch that would still be running on the company’s own wearable operating system. On the basis of our experience with previous efforts, that would have been a very bad idea indeed. Thankfully, the real deal SmartWatch 3 that’s just been launched at the Berlin show is indeed running Google’s Android Wear smartwatch OS. Despite the naming, it’s actually Sony’s fourth generation SmartWatch device being unveiled, and it shows. Fully waterproofed to an IP65/68 rating, its minimal design shares some similarities with the new Xperia Z3 range, right down to the display tech used. Packing in a 1.6-inch 320 x 320 resolution squared-off LCD screen and powered by a 1.2GHz quad-core ARM A7, it has what Sony’s calling “Transflexive” display technology to boost contrast levels in harsh ambient lighting, meaning that it shouldn’t be a washed out chore to look at in direct sunlight. This core face piece can be popped out of its strap, and replaced inside other sold-separately rubber straps of a variety of colours. The stretchy band, finished off with a folding metal clasp, still feels very much like a “smartwatch” rather than “a watch which is and looks smart”, which may mean those waiting for a more subtly-styled connected timepiece will still want to hold out for the circular Motorola Moto 360. With a two day battery life, the watch will be compatible with any Android device running Android 4.3 or newer — not just Xperia phones. And it’s got a few unique features too — 4GB local storage will let you use it as a music player without needing a phone to beam them from first, while a built in GPS sensor will let runners track their routes without having a phone jostling around in their pockets. 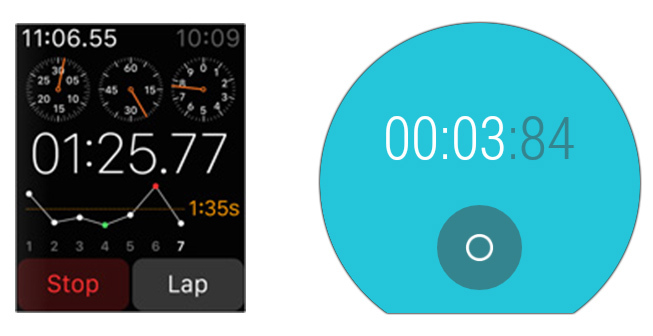 As with other smartwatches, the SmartWatch 3 can also be used as a shutter trigger for a connected phone’s camera. Coming at some point in “the fall” (that’s autumn to you and me), expect to pay around $250. No one has really figured out what a smartwatch should look like yet, but one thing is for sure: Google and Apple have taken vasty different routes to getting a computer on your wrist. To show just how different, we put together this gallery of similar screens from the Apple Watch and Android Wear. They should be easy enough to tell apart: the Apple Watch is the square one, while the Android Wear screenshots are all from the Moto 360 and therefore (mostly) round. Display Specifications – What are they? Apple hasn’t released specs for the screen, and where exactly the bezel stops and starts in many of Apple’s promotional shots is up to interpretation. By our calculations, though, and by using enlightening images like this, it looks like the Apple Watch has a 4:5 aspect ratio. 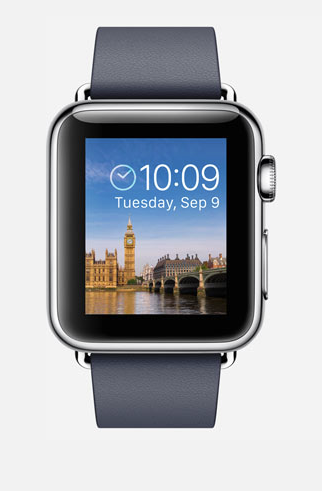 The watch OS (we don’t know the operating system’s name yet) usually has a black background picture on a black bezel, so to maximize screen space, Apple often puts UI elements right against the edge of the screen, allowing the bezel to act as the “padding” that would traditionally be in a well-designed interface. Information Density, What is it? Of course one is round and one is square, but the biggest difference between the two platforms is information density. Google seems content with only a few lines of text OR one button per screen, while Apple seems to want to pack as much into a single screen as it can. It’s almost the complete opposite of what you would expect from the two companies: Google built an airy, picture-heavy OS, while Apple built a more powerful, denser OS with an all-black motif. Fitt’s law is in full effect here. Google’s huge one-per-screen buttons will be easier to hit in a hurry, but getting to the one you want will require more scrolling. Apple doesn’t require as much scrolling, but tapping the smaller buttons will take more aim and care. Apple’s watch OS is so dense it has added a side-mounted jog dial (a “digital crown” in Apple-speak), which will let you “tab” through screen options. This means targets don’t need to be large enough for touch, and allows users to interact with the screen without covering it. Ironically, smartphone Android supports touchscreens, d-pads, keyboards, mice, trackballs, video game controllers, and nearly every input method on Earth, but none of that made it to Android Wear, which only supports a touchscreen. Apple rarely demoed voice commands—all of its apps and features seem usable with tap or jog dial input—while Android Wear depends on voice input for many features.